Our hammam bowls and buckets make an attractive addition to any bathroom, providing decorative containers to display towels, special soaps or to keep track of beauty products. The detail in the decorations on this bowl makes a pretty combination with the gleaming silver metal. Choose a colour to match, or perhaps complement the finish of your bathroom fittings. 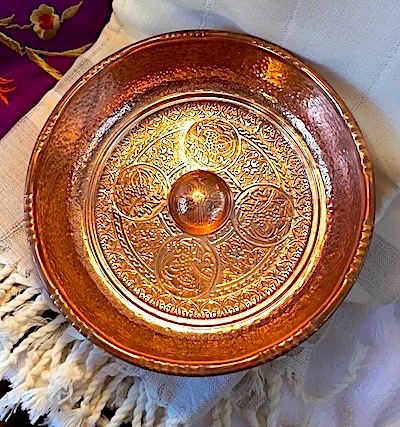 Click on the photo for an overall view of the silver hammam bowl. Here we have the warm radiance of copper. Click on the photo for close up of the pattern. to the local hammam, as many homes in the medina did not have bathing facilities. 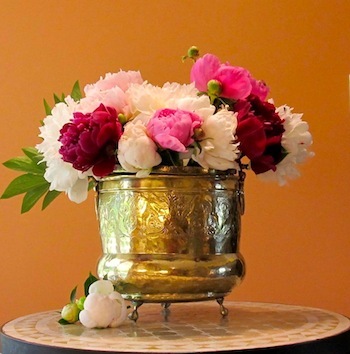 floral arrangement or leafy plant. signs of use, but it's all part of their charm. Other designs are available, usually with floral themes.